This was ordered from case maker Kanye Wayne via Ebay, and fits the GF1 perfectly. As it gets more battered, it looks even better. The case cost me around $90 plus shipping, and was worth every penny. The camera isn’t in the picture, because it’s taking the picture. I have written at length about this bag here in the pages of Cult of Mac. It’s light, comfortable, customizable and good on or off the bike. It also swallows everything you see here easily. It’s the best bag I ever had — and I have owned a lot. This, too, has seen a Cult of Mac review, and is the best of many cases I have used. It’s light and tough, like the case and bag above, and very practical. It also fits the iPad 3 (although inside this one is the 64GB iPad 2 3G in black, with many scratches). This only comes out when I’m on the bike, of course. It contains a Topeak Hexus multitool, tire levers (Decathlon), patch kit, Surly Jethro Tule 15mm wrench (with built-in bottle opener), spare tube and pump. With this relatively light kit, I can always make it home. This is a small pouch from a Kata camera bag continaing spare SD cards, Apple’s camera connection kit (just the SD reader, not the USB adapter), a tiny USB stick from Sandisk with removable microSD card and a small brush from my electric shaver, repurposed for cleaning dust off a camera. This lets me process photos with my iPad, wherever I am. The classic Porta Pros, only with inline remote and mic. They’re tough little things, although they don’t look it, and roll up like a hedgehog in distress for storage. This compact ball and light weight are why I carry them. They sound pretty great, too. This is — embarrassingly — my cellphone. I have had it for around four years, and it is the worst phone I have ever owned. It rings off after only a few rings, sometimes it refuses to let me answer a call and writing a text is so frustrating I have literally thrown it into a wall in anger more than once. However, it’s only used for emergencies (I almost never use a phone), is impossible to break and lasts more than a week on a single charge. I hate it. This is hands-down the best stylus I have used for the iPad. The tip glides over the screen, the heft is good and it even has a kind of faux clicky tip which requires a slight bit of pressure to actually draw a line. If you’re looking for an iPad stylus, buy this one. They cost around $30. I bought this last week and I love it. It’s my fourth iPod Touch over the years (I broke them all), and with FaceTime, a Retina display and iMovie, it’s also the best. The cameras are kind of crappy, but it makes a great note-taking tool, and serves as a second monitor used alongside my iPad when working. Leather, bought from the maker at a market in Berlin. It holds cash, cards and has a pocket for change. And the leather, like that of the camera case, gets better with age. This only comes along when I’m planning on working (I’m typing on it right now), but it’s a great little keyboard. Lightweight, it doubles as an iPad case and holds the iPad in either portrait or landscape orientations. The keyboard itself is almost as good as the Apple Bluetooth I use with my iMac, and the built-in li-ion battery seems to last forever. A great tool which cost me €99, and has paid for itself by letting me leave my MacBook at home way more often. I use this for cheese, to cut croissants to share with The Lady in coffee shops, to cut fruit and to dig stones out of my tire treads. I have owned this one for only a few months, and there are a couple more around here which I have had for years and years. The blade folds out of the wooden handle and is secured when open or closed by a metal collar. They stay sharp, they don’t fold on your fingers when you cut, and they don’t make you look like a psycho if you pull one out in a restaurant (sometime I use mine as a steak knife). They’re also pretty cheap, and will last you forever. The best portable Bluetooth speaker around in terms of size:sound ratio. There are better speakers, and lighter speakers, but the combination of long-life, great sound, tough body and USB charging make this my favorite. It only comes with me on overnight trips, and when teamed up with an iPad using the speaker’s Live Audio 3-D sound processing, movies look and sound awesome. $200. Got any questions about what’s in Charlie’s bag? 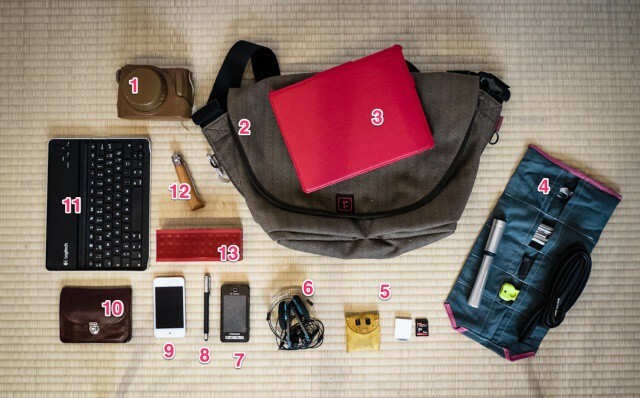 Want to share with us what’s in your gadget bag? Jump into the comments below!